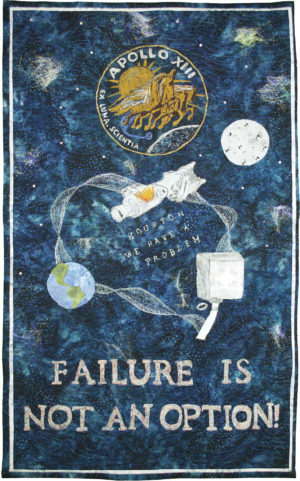 This quilt was made as a tribute to my daughter, Jaclyn, who trained as an Aerospace Engineer, loves all things aerospace and whose favourite mission is Apollo 13…to the point where she has read the mission manuals and can recite the entire script of the movie while inserting the engineering facts. This quilt also includes a special nod to the Canadian engineers who contributed greatly to making the safe return of Apollo 13 possible. See if you can find it! The quilt is a pictorial of the mission itself and what actually occurred: my version of the Apollo 13 Mission patch and the trajectory which was intended to be from earth to moon, but which instead became a harrowing trip to space and then back to earth. The explosion announced by the words “Houston we have a problem” and the engineering fix which was successfully completed using the materials available on board Apollo 13 are legendary. While it is said that the phrase ‘Failure is Not an Option’ may not have been said in exactly that way during the actual mission, all who were involved in bringing the astronauts safely back to earth, especially the international team of engineers, lived by the mantra ‘Failure Is Not An Option’ which subsequently became the title of the movie based on the Apollo 13 Mission. I used actual pictures of Apollo 13, the mission patch and the ‘fix’ as the basis for my threadpainting of these items. Embellishments were added. Superior Threads, Kimono silk, Rainbows, metallic, Razzle Dazzle, Halo, Bottom Line, Angelina fibers, Swarovski crystals, beads.